Provide comfort for the family of Katherine Rich with a meaningful gesture of sympathy. Katherine Bologna Rich died peacefully on March 15th, 2019 in her home at Hill House, Riverside, Connecticut. She was born on January 8th, 1921 in Port Chester, N.Y. the third child of the late Nicholas and Mariantonia D’Andrea Bologna. She was predeceased by her husband of 63 years, George Rich who died in 2004. A resident of Cos Cob Connecticut for all of her life and a graduate of Greenwich High School, she was proud to be a homemaker and caregiver to of her family members throughout the years. She particularly enjoyed spending time with her Grandchildren, Great-Children and Great-great Grandchildren and especially loved the babies. Katherine maintained a home sewing business for many years and was especially skilled in altering and designing clothing for her customers, many of whom still fondly recall her. 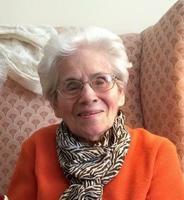 In addition she enjoyed quilting, painting and sketching, she loved literature and was an avid reader. Katherine was a wonderful cook and loved to spend Holiday dinners with her family. Wendy Maxwell Norton of Durham, CT; Amy Maxwell St. John of East Haddam, CT, Paul Nastahowski of Stamford, CT.,Larry Maxwell of Moodus, Conn., Katherine LoBalbo Bennett of Cos Cob, CT.,Nicholas LoBalbo of Newtown, CT., Maria LoBalbo Streaman of Bethel, CT. ; 10 great-grandchildren and 2 great-great grandchildren. Katherine was predeceased by her brother, Anthony Bologna and her sisters, Theresa Bologna Zadrosny and Rosemary (Babe) Genovese. The family would like to give special thanks to Maria Barbosa and Betty Laguna, both of whom were longtime friends and caregivers of Katherine and were much beloved by her. To send flowers in memory of Katherine B Rich, please visit our Heartfelt Sympathies Store.